I know how busy the Christmas season can be. Sometimes you just don’t have the time to make an elaborate cake for every Christmas party or Holiday get-together you attend. Here is a cake recipe that is deliciously, decadent and impressive looking, while being super easy to make. 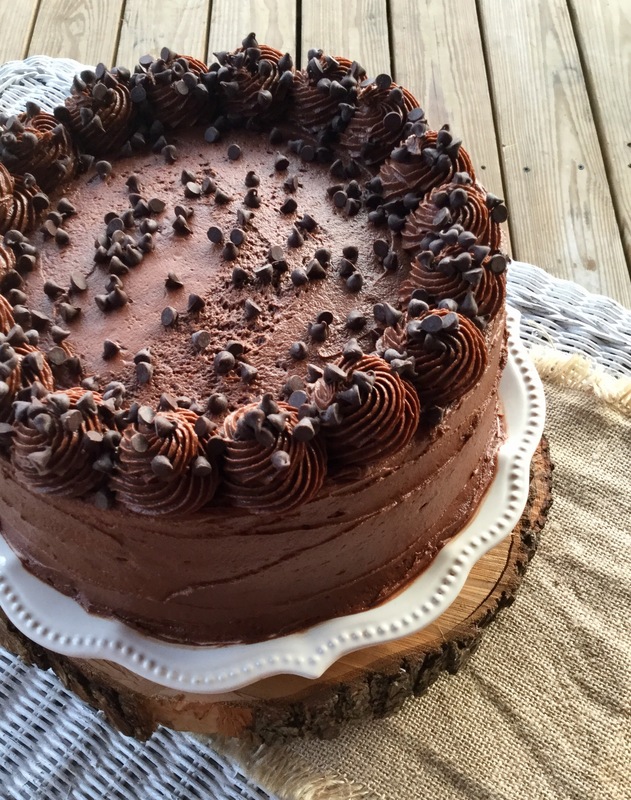 The frosting is absolutely my favorite part about this cake! 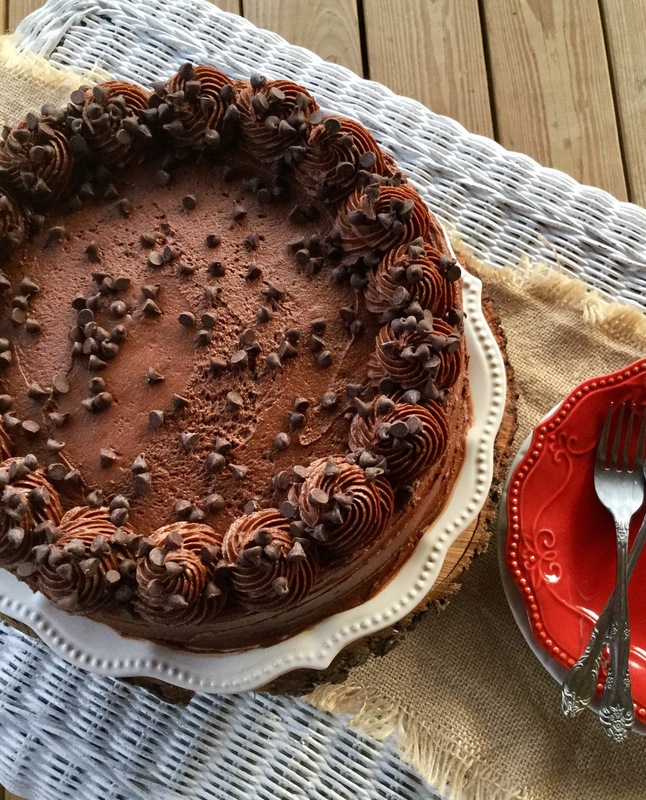 I had never seen a chocolate frosting recipe like it before… it definitely caught my attention. 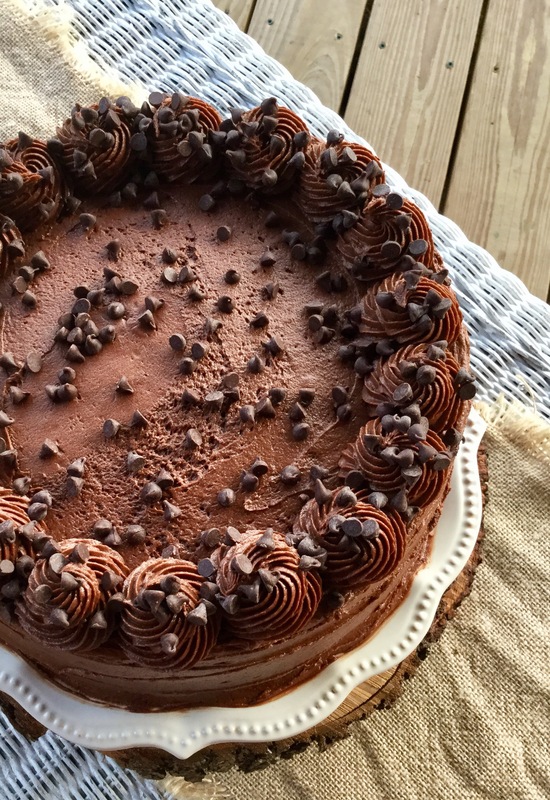 It’s a perfect blend of chocolate buttercream and fudge frosting. The texture is velvety and will melt in your mouth. I did have a catastrophe some trouble piping it though. I didn’t thoroughly melt my chocolate, I had a few tiny pieces of chocolate that would get in my piping tip and prevent me from piping. Make sure you melt your chocolate well, BUT be careful not to burn it. 1)It really doesn’t matter what kind of chocolate cake mix you use…German Chocolate, Dark Chocolate Fudge, or Devil’s Food. 2)As I mentioned before, melt your chocolate thoroughly. I melted my chocolate in 1 minute intervals with a 30 second rest. As the recipe I followed states, you want the chocolate to be completely melted without allowing it to get hot. 3)I did weigh my chocolate on a kitchen scale, I used a mixture of chips and chopped chocolate. Make sure you finely chop your chocolate, I didn’t chop mine finely enough. Preheat oven to 350 degrees F. Spray three 9-inch cake pans with non-stick cooking spray and line with parchment paper. In a large mixing bowl, beat all the cake ingredients (except for chocolate chips) using a hand-held mixer. Then fold in the mini chocolate chips with a spatula. Divide batter between the three cake pans. Bake in preheated oven for 22-25 minutes or until toothpick inserted comes out clean. Let the cake layers cool for 10 minutes in their pans before turning them out onto a cooling rack to cool completely. While the cake layers are cooling, prepare the frosting: Place the chopped chocolate in a large mixing bowl. Melt chocolate in the microwave for 1 minute and then allow it to sit for 30 seconds, then stir. Continue to repeat this process until the chocolate is melted, cooking for 1 minute, then 30 seconds rest, stir. Set aside. In the bowl of a stand mixer fitted with the whisk attachment, beat the softened butter, sweetened condensed milk, heavy cream, and vanilla on medium speed until light and fluffy, this will take about 5 minutes. Sift together the powdered sugar and cocoa powder and then slowly add to the creamed butter, beat well after each addition. Then, add in the cooled melted chocolate and beat on high speed until smooth and completely combined, scraping the bowl as needed. Place the frosting in the refrigerator﻿ for about 10 minutes and then beat it again before frosting the cake. Cake recipe was adapted from HERE. Frosting recipe was adapted from HERE.